Regional hegemon China remains a focus of Pacific tension. Now Harpia offers the perfect anodyne to today’s vacuous and shallow reporting on Chinese air power. 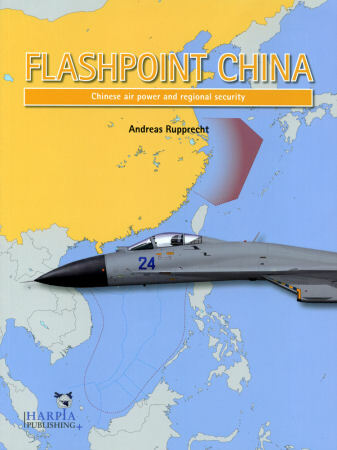 Available in North America from Casemate, Flashpoint China bears all the hallmarks of Harpia’s previous publications: superb inquiry, balanced briefings and logical layout – but in a new, compact format spanning just 78 pithy pages! It’s the stuff of competent intelligence analysis. Coverage neatly and geographically divides into separate chapters on PRC commands – northern, eastern, southern and western. Sections survey key Chinese capabilities, basing, procurement, R&D and assets – including naval forces. But I think author Andreas Rupprecht means “green water” – not “brown water” – to denote coastal operations. Contents also recap historical, territorial, economic and defense considerations with neighbor states. Topics and implications remain as fresh as today’s headlines. The South China Sea. Spratly Islands. Woody Island. Border disputes. Islamist insurgents. Even America’s 1990 Pressler Amendment. Rupprecht also explores potential conflict scenarios. One, for instance, posits a possible Chinese invasion of North Korea – making Pyongyang Beijing’s vassal state. The generously illustrated effort sports dozens of color photos, 12 tables and six maps. Best of all, this vital volume completely complements Harpia’s excellent Modern Chinese Warplanes – also by author Rupprecht.